The food industry is big business – and many Americans cast a skeptical eye toward the information it provides to the public about genetically modified (GM) foods. A new Pew Research Center survey finds most Americans have limited trust in information from food industry leaders. 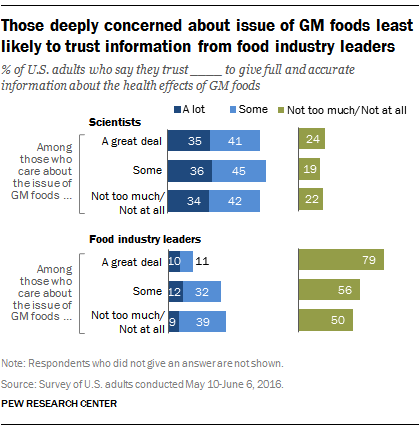 Only one-in-ten (10%) say they trust food industry leaders a lot to provide full and accurate information on the health effects of GM foods and another 32% say they trust information from food industry leaders some. A majority (57%) do not trust information from food industry leaders too much or at all. And people who are deeply concerned about the issue of GM foods are especially distrustful of information from the food industry. Some 16% of Americans say they care a great deal about the issue of GM foods. Another 37% care some and 46% care “not at all” or “not too much” about this issue. Just 21% of those that care a great deal about the GM foods issue say they trust information from food industry leaders at least some, while 79% say they don’t trust information from food industry leaders too much or at all. By comparison, those less engaged in the issue of GM foods are more trusting. Some 48% of those who do not care at all or too much about the GM foods issue say they trust food industry leaders a lot or some to provide full and accurate information about the health effects of GM foods. It’s hard to know exactly why people with deep concern about GM foods are skeptical of food industry leaders. Nearly seven-in-ten of this group (68%) say they follow news reports about GM foods very or somewhat closely. Industry groups have long supported food and health research, but their role in that research has sometimes raised questions about the independence of the research and whether such studies tend to favor the industry. Americans who care a great deal about the issue of GM foods are also particularly likely to think the industry influences research on GM foods. Half (50%) of those who care a great deal about this issue say researchers’ desire to help the industries they work with, or for, influences research on GM foods most of the time. 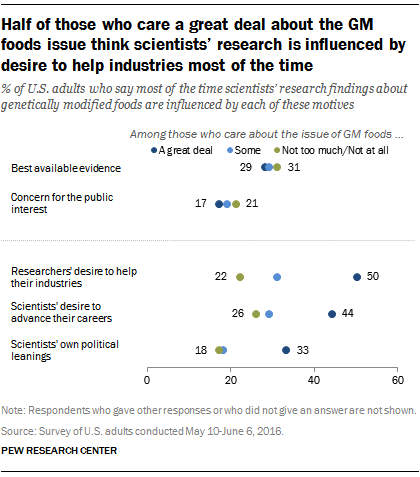 By comparison, 22% of people who care not too much or not at all about the issue of GM food say the desire of researchers to help their industries influences research findings most of the time. There are more modest differences between those deeply concerned and those less concerned on how often scientists’ desire to advance their careers or scientists’ own political leanings influence research findings on GM foods. But both groups are equally likely to say that the best available evidence or concern for the public interest influences research findings most of the time. 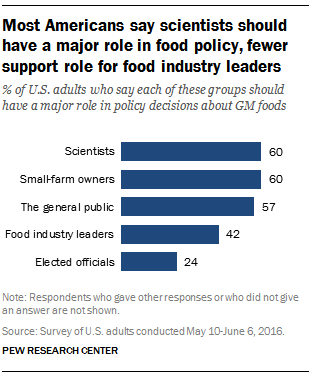 Regardless of degree of concern about the issue of GM foods, more Americans say that scientists should play a major role in policy decisions on GM foods than say the same about food industry leaders (60% vs. 42%). Some 57% of Americans think the general public should have a major say in policies related to GM foods as well.